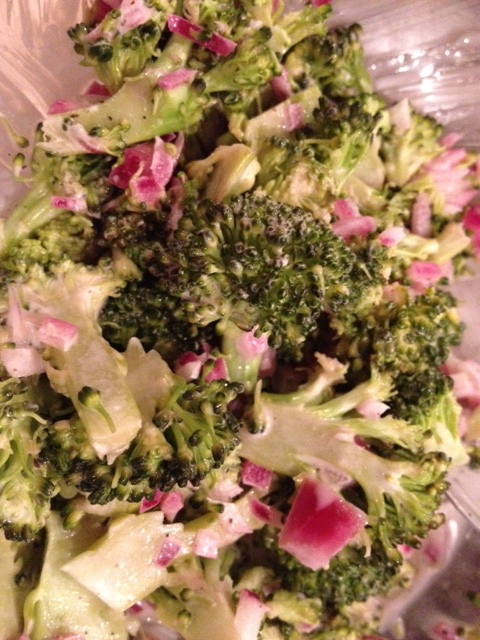 I was first introduced to Broccoli Salad almost 15 years ago now. My family and I were invited to a cook-out and among all the food available, there was a brocoli salad. I had eaten very little brocoli by then, as it was not a vegetable available in France, but curious that I am, I tried it and loved, loved it!!! The recipe that I am proposing is a variation of what I usually fix. I usually add bacon and sharp cheddar cheese to my salad, but today i wanted to prepare a leaner salad. Ingredients: 4 cups of brocoli, 1/2 red onion diced, 2 tbsp of mayonnaise, 2 tbsp of white vinegar, 1 tbsp of granulated sugar, 1/4 tsp of salt, 1/8 tsp of pepper. In a large bowl, place all the ingredients and mix well. Then add the diced brocoli and the diced onion. Mix well. Place the salad in the fridge to chill and so as to let the brocoli absorb the dressing. C’est tout!